For the safety of all the volunteers, girls and staff we rescheduled Cookie Rally to January 20th, 2018. Daisy, Brownie, and Junior Girl Scouts join the Cookie Rally fun! 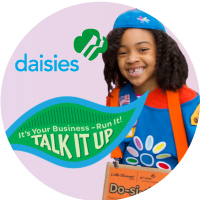 Learn how to rock your cookie business, while also earning one of your Cookie Business Badges. Even dress as your favorite cookie to march in the rally parade. On the Daisy track you'll meet the cookies by matching names, colors and ingredients. Even practice your cookie sales pitch and learn about fun goals vs. giving back goals. You'll learn to count money like a pro and takeaway your own cookie fact card. 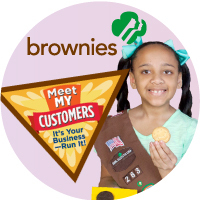 On the Brownie track you'll learn how to give cookie description and recommendations. Even map where your customers are and practice your cookie sales pitch. You'll learn to make change like a pro and takeaway your own thank you cards. 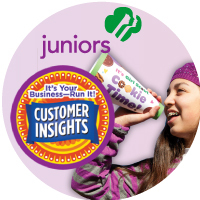 On the Junior track you'll learn how to up sell while giving cookie descriptions. Then find out the top reasons customers don't buy and how you can respond. Even listen for clues and how to adjust your pitch. Then learn how to manage money to reach your goals and takeaway your own business cards. Morning: 10:00 a.m. - 1:00 p.m. Afternoon: 2:00 p.m. - 5:00 p.m.
Tickets will sell out buy them early!